5 Years Frack Free Celebration! Join us for an anniversary action on Saturday 21st May to celebrate an incredible 5 years frack-free! This is a huge achievement for the anti-fracking movement and a crucial milestone that everyone should be made aware of given current fracking threats. 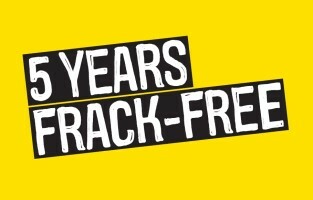 The most important thing about celebrating 5 years frack-free is KEEPING the UK frack-free! At the moment, the Government is threatening to take away the power of local communities to protect themselves from fracking. This means that communities in Lancashire and Ryedale, who have clearly said no to fracking, are facing being over-ruled by the government. By celebrating 5 years of game changing people power from the anti-fracking movement, we will be sending a message to government that we won’t stop until fracking is gone for good. Send your message by meeting us at Victoria Square on Saturday and posing for a photo with one of our frack-free posters. We will also have a petition you can sign along with plenty of info on fracking.